Having an off night shooting is never a good thing — no matter the opponent — but when its against the only team to defeat you in conference play it could a sign of a long night. 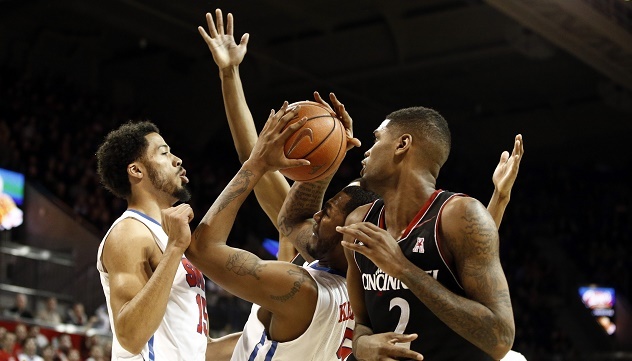 Thats exactly what happened as the Cincinnati Bearcats limited the SMU Mustangs to shooting 36% on its was to a victory 62-54 on Thursday night at the Moody Coliseum. SMU entered the contest with the third place Bearcats having a +11.6 FG% margin (FG% – FG% defense) over its opponents but in Thursdays contest they were -20.3 as Cincinnati shot 56.8% from the field — its most efficient shooting night on the season. In 21 previous games the Bearcats shot above 50% only five times but against the Mustangs, the team’s offense came to life. Despite forcing almost as many turnovers (10) as shot attempts (11), SMU was only up 25-20 at the end of the first half thanks in part to its key players: Ben Moore, Nic Moore, Ryan Manuel contributing only three points on 1-of-7 shooting. Unfortunately for SMU fans the cold shooting worsened in the second half as the team shot 32% in the second half and only made eight field goals. Unlike his teammates, Cunningham had a great game as he led the team in scoring with 14 points on 6-of-10 shooting and three rebounds. All season it has been about energy for the senior from Arlington, TX. When he plays with it, it reflects favorably in the statsheet — even though head coach Larry Brown stresses that contributions from his players goes beyond the boxscore. Surprisingly during the crucial moments in the second half, Coach Brown chose to keep Cunningham on the bench in favor of Yanick Moreira and Markus Kennedy, who did not contribute much on the offensive end of the court — a combined 6-of-17 for 16 points. Despite not playing well all game, the Mustangs were within striking distance when Sterling Brown (12 points, seven rebounds) made a lay up to cut the deficit to 55-52 but Cincinnati responded with a three-pointer from Shaq Thomas late in the shot clock that sealed the victory for the Bearcats. Jermaine Sanders led the way with 15 points and nine rebounds for the Bearcats who also got 14 points a piece from guards Troy Caupain and Farad Cobb despite having a 13:17 assist-to-turnover ratio. The next one is just as important as the Mustangs (18-5, 9-2) travel to Tulsa to face the AAC leading Golden Hurricane as SMU hopes to cut into Tulsa’s two-game lead in the conference standing. Led by junior guard James Woodard (14.9 ppg and 4.9 rpg) Tulsa (17-5, 10-0) is coming off a 57-44 road win over the Houston Cougars. Despite being the best team in the conference, Tulsa has struggled with the bottom tier of the conference and the victory over the Cougars was the first double digit win over a team with a losing record in the last four games.